Here you have a wonderful chance to become a real stylist! These cute girls are waiting for you, because you need to choose the perfect outfit for them and pick up everything perfect! We know that you will do it. Enjoy the game. Wow! That's great! Cause now you have a great chance to become a real stylist. 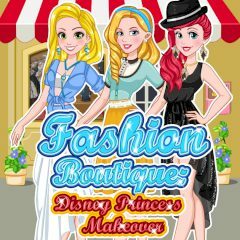 Here you will have your own shop, where you can choose for these cool girls the most incredible looks. So, just try to do everything right and help them to choose only best looks. Are you ready for such a cool challenging game? Then do not limit your imagination and make these cool girls the most beautiful today. Everything depends on you, just have faith in yourself and create the most incredible looks for them. Enjoy the game right now and have so much fun here.